10 October 2014 — HAPPY THANKSGIVING! 25 September 2014 — It's Time To Build The Children's Hospital! 31 July 2014 — Opportunity For Children To Be In The Exhibition Parade On Tuesday, August 5! 8 May 2014 — Happy Mother's Day! 17 April 2014 — Happy Easter! 4 April 2014 — Congratulations Craig Steveson - Coach Of The Year! 1 April 2014 — Special Birthday Edition! 19 March 2014 — Today is Budget Day! 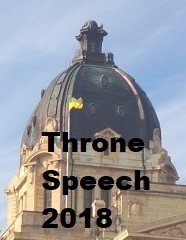 20 February 2014 — Saskatoon Festival of Education 2014 - "A GREAT SCHOOL FOR EVERY KID"